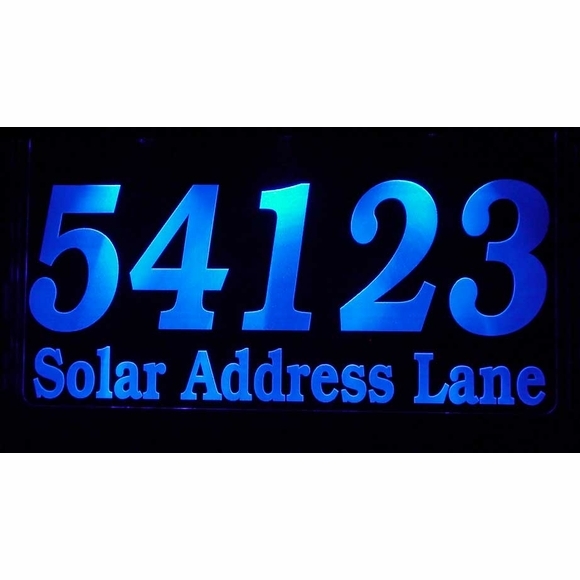 Custom Solar Lighted Address Plaque - - 13.5" x 6.5" personalized solar illuminated address sign with lawn stake. 3" high numbers. Lights the way for emergency responders, delivery drivers, service providers, and guests to find your home at night. Tested & Approved by Comfort House. The LEDs are indeed super-bright at night and the lasered numbers are impressively visible during the day. Your house number and street name are lasered onto a clear acrylic plate. Super bright solar sign turns on automatically during the night. Turns off and charges during the day. Built-in amorphous solar panel charges even on mostly cloudy days and glows for up to 12 hours. Customized just for you with address number on Line 1 (up to 7 characters) and family name or street name on Line 2 (up to 23 characters). Line 2 is optional. If you prefer a one-line sign with just the house number, please leave the Line 2 input box empty. Made from durable weather-resistant acrylic. Illuminated by three super-bright LED lights. Dimensions: 13.5"W x 6.5"H x 3"D.
Three LED colors available: blue, green, or white. Lighted address plaques for homes and businesses powered by free solar energy. No wiring required.